Smart. Bright. Intelligent. These are the sort of words that people often use to describe gifted children. Although there are many types of giftedness, most states, teachers, and parents recognize intellectual giftedness as an important type of giftedness in children. Despite this widespread recognition, few people understand the psychological theory of intelligence. To help remedy this, I wrote an article for Gifted Child Quarterly, “Five Reasons to Put the g Back into Giftedness: An Argument for Applying the Cattell-Horn-Carroll Theory of Intelligence to Gifted Education Research and Practice,” that explains the mainstream theory of human intelligence, suggests why people should use the theory in gifted education, and cautions against potential misuses of it in that field. If you don’t want to read the entire scholarly article, you’re in luck! This blog post gives you a brief summary of my work. What is Intelligence? 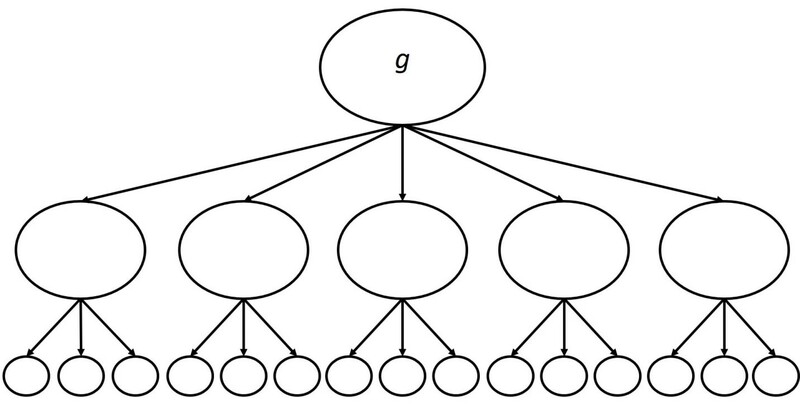 One popular definition is “...a very general mental capability that, among other things, involves the ability to reason, plan, solve problems, think abstractly, comprehend complex ideas, lean quickly and learn from experience.” Leading psychologists view intelligence as a general ability (labeled g) that sits atop a three-level hierarchy of mental abilities, as shown in the picture below. Those in the higher layers are broad and apply to many contexts; lower-layer abilities are narrower and more specific. This is called the Cattell-Horn-Carroll model (named after three psychologists who contributed greatly to its development). It is important because it includes every cognitive ability yet discovered by psychologists, including verbal ability, abstract reasoning, vocabulary knowledge, mathematical ability, spatial reasoning, reaction time, short-term memory, and more. General ability, “g,” includes them all. Intelligence is one of the best-understood concepts in psychology. It’s had the attention of experts for over one hundred years, allowing scientists to make remarkable progress in their understanding of how it’s affected by brain structure, genetic causes, and mental processes. In fact, some psychologists say that we comprehend intelligence better than any other concept in the field, including depression, personality, and creativity. Experts know how to differentiate for intelligence. Any gifted education expert will tell you about the importance of differentiating instruction to meet the individual needs of gifted children. Research has shown that more intelligent children can move through the curriculum more rapidly, do not need as much rote instruction and drill, and are capable of making connections across disciplines and lessons. Therefore, intelligence theory provides a scientific grounding for many of the recommended best practices for differentiation in gifted education. Intelligence can serve as a bridge between gifted education and other fields. Unfortunately, gifted education as a field of study is often neglected, ignored, and isolated. On the other hand, intelligence research has connections with cognitive psychology, neuroscience, public health, and special education. Indeed, few concepts in the social sciences are as interdisciplinary as intelligence, and gifted education can join this conversation. I believe that cross-pollination between gifted education and these other fields can only be a good thing for the field. Intelligence predicts long-term outcomes. One of the most remarkable things about intelligence research is how many life outcomes intelligence test scores can predict. High childhood or adolescence intelligence is associated with adult income, life expectancy, job performance, and many other beneficial life outcomes. This is relevant to gifted education because most advocates in our field are genuinely concerned for gifted children, and that concern does not end when children turn eighteen. Intelligence research can inform gifted education practice. Unfortunately, gifted education programs in many districts are often atheoretical (and occasionally incoherent). For example, identification procedures often do not align with program content, which means that students who would benefit from the program often are not selected for it, while students in the program may not have needs that the program is designed to meet. Understanding how intelligence and other cognitive abilities fit together into the Cattell-Horn-Carroll model can help create coherent programs. A STEM academy, for example, may focus on abilities that are important for success in these fields, such as high spatial reasoning and mathematical ability, while a creative writing honors class would select students who have interest in literature and who have high verbal ability. Some readers might conclude that bringing intelligence back into gifted education would be a disastrous regression to an era that equated giftedness with a high IQ. But this is overly simplistic. The Cattell-Horn-Carroll model is more than just a model of general intelligence; it is an understanding of how all cognitive abilities relate to one another and to the real world. Indeed, intelligence research is compatible with almost any theory or legal definition of “giftedness.” Rather than making giftedness synonymous with high IQ, intelligence theory gives teachers, theorists, scholars, administrators, and other stakeholders a common scientific basis for understanding high cognitive abilities. Linda S. Gottfredson, “Mainstream science on intelligence: An editorial with 52 signatories, history, and bibliography,” Intelligence 24 (1997): 13–23, doi:10.1016/S0160-2896(97)90011-8. David Lubinksi, “Spatial ability and STEM: A sleeping giant for talent identification and development,” Personality and Individual Differences 49 (2010): 344–51, doi:10.1016/j.paid.2010.03.022. Scott J. Peters et al., Beyond gifted education: Designing and implementing advanced academic programs. Waco, TX: Prufrock Press, 2014. Russell T. Warne, “Five reasons to put the g back into giftedness: An argument for applying the Cattell-Horn-Carroll theory of intelligence to gifted education research and practice,” Gifted Child Quarterly 60 (2016): 3–15, doi:10.1177/0016986215605360. Russell Warne is an assistant professor of psychology in the Department of Behavioral Science at Utah Valley University.